Am I the only one who has forgotten dreams? During the last year, God has been stirring my heart and reminding me of dreams He planted in my heart long ago. Over time those dreams have been silenced by self-doubt, people-pleasing, and fear. I’ve chosen to focus on what I “should” do or what I know I can do well. I have left faith behind and chosen comfort instead. In my last post, I told you I was choosing to make this a year of obedience. This is a terrifying choice on a number of levels. Mostly because I have no idea what God might call me to. Or if I’ll be able to do what He asks of me. But I’m tired of thinking that way, of being ruled by fear. So I’m also making this the year of punching fear in the face. I can’t take credit for this concept. 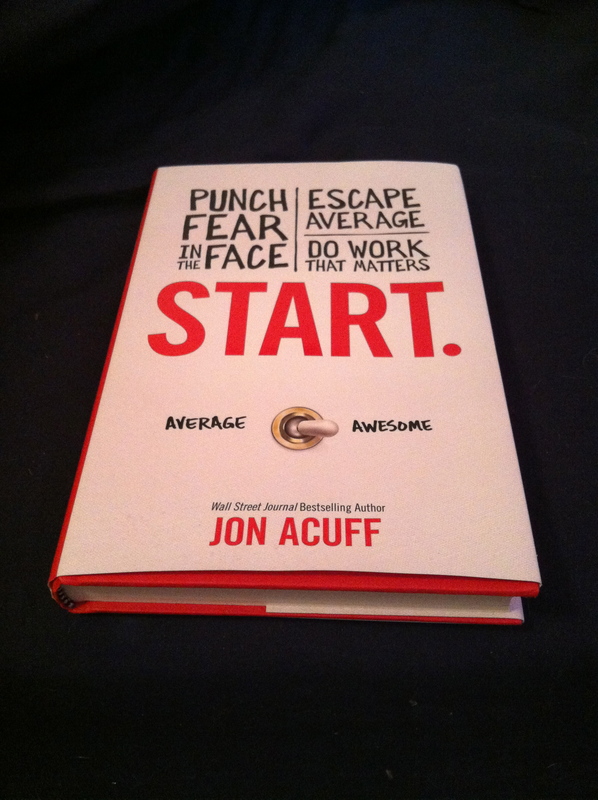 It comes from Jon Acuff who wrote an amazing book called START. It’s all about punching fear in the face, escaping average, and doing work that matters. I think we all need to do more of that. I think that God is inviting each of us to play a role in restoring beauty. I think that many of us say no to that invitation because of fear. I think this needs to change. What would you start if fear stopped being a factor? What business or organization or blog would you start? What book would you write? What art would you create? Here’s a better question: What beauty would you restore if you knew you couldn’t fail? Figure out how to make your dream a reality. And then go do it. I’m giving you the opportunity to win a copy (hardback!) of Jon’s book, START. c) tell me a little about the dream you want to get started on in the comments below. Do this by midnight on February 6th. I’ll draw a winning name from those who complete all these tasks. I’m praying for you! Just think how beautiful our world will be when we start pursuing our dreams for God’s glory! This entry was posted in Blog and tagged be awesome, fear, punch fear in the face, Start. Bookmark the permalink. I would love to make a living off of selling my hand-lettering art! I would love to make a living off of my art! I want to have a constant ebb and flow of supplies going out to the orphanage, preschools, and churches in Ecuador and Peru. So much so that they are able to have a sort of free shop where they can always go to pick up the supplies that are needed at the time. Almost like going shopping at goodwill, but FREE!! I want to write my novel, not just talk about writing it. I’d love to be published: either a book, magazine, journal. And one day I’d love to write and speak full time.